A capacitive type touch screen is coated with indium tin oxide (ITO) and an electrical current is continuously conducted across the screen. When a finger touches the screen, it draws a minute amount of capacitance to the point touched, and then the X-Y coordinates are calculated by the controller and transmitted to the operating system to locate the position of the finger. Projective type capacitive touch panels offer fast and sensitive touch response with excellent multi-touch navigation performance. Young Fast’s advanced capacitive products are designed for optimized optics, durability, low power, easy integration, and an attractive user interface to meet the rigorous needs of consumer electronics. By collaborating with renowned IC vendors to develop high-speed and sensitive controllers, Young Fast has successfully minimized the impact of noise interference and has enhanced optical transparency. Young Fast offers a wide array of capacitive TPS solutions, from the high-end all glass to the low cost film/glass and thin film/film/film. 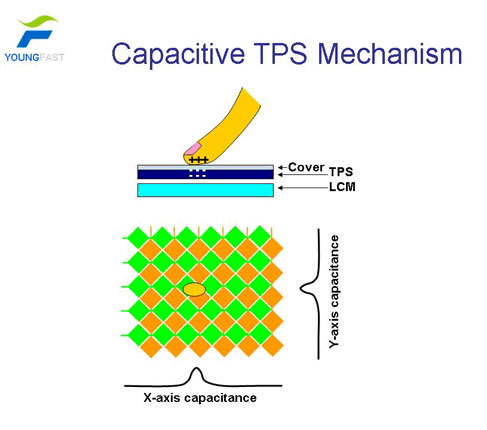 The following diagram shows the structure of the Capacitive TPS solution. Surface Hardness 3H- pressure 500gf , 45deg.